Lance Corporal 8079 Arthur James Rosier, 14th Battalion, Hampshire Regiment. Arthur was born in East Woodhay in 1889, the son of William Rosier and his wife Jane née Jones. He had nine siblings, but four died very young: Amy Alice (1879-1879), William Alfred (1880-1880), Albert Edward (1884-1887) and Samuel George (1899-1899). The survivors were: Walter John Rosier (1883-1849), Charles Henry (1887-1953), Florence Augusta (1891-1967), Archibald (1894-1927) and William Thomas (1897-1943). The family lived at The Mount, East Woodhay and later at the School House in Woolton Hill. Despite this move William was not a schoolteacher but a surveyor; reading from census returns he started as a labourer but became first a sub-surveyor of roads for the Kingsclere District Council and then the council’s Assistant Road Surveyor. In reality he was the foreman of the local road repair team, nevertheless this was quite a rise in status from his early days as a labourer. The family’s occupation of the school house was explained by Jane’s employment as school caretaker. The children took a range of jobs: William Alfred became a shoeing smith, Charles a groom, Florence a kitchen maid and Alfred a footman. Sadly it has not been possible to determine what Arthur did immediately after leaving school, but it seems likely that he enlisted into the army as a boy, around the age of 16. Lads would often be recruited as drummers or buglers, at the age of 18 they would enlist as regular soldiers. Some, who showed particular promise as musicians would remain as members of the regimental band a relatively cushy role concentrating on practice and ceremonial duties rather than guard duty or the other day to day activities of an infantryman. Arthur served with the Hampshire Regiment and was recorded in the 1911 census as a musician serving with the 2nd Battalion in Mauritius. Assuming his full enlistment was on his 18th birthday he would have completed his service in uniform on his 25th birthday in 1914. It possible that he had left the 2nd Battalion, then serving in Mhow, India, as a consequence and reached home before the war, if so he would have received his mobilisation notice on 5 August and soon reported back for duty. Alternatively he was still with the battalion when war was declared and travelled back to England with it. His medal records show that he first entered a theatre of war on 25 April 1915, and that the theatre entered was ‘2b’ – he had arrived at V Beach on Gallipoli. Most of the 2nd Battalion spend that day in the hold of the SS River Clyde, an old collier that had been converted into a landing ship for the assault. Boats towed astern were to be used to create bridges to the beach after the old ship ran ashore and two battalions of infantry would pour across them to sweep the Turks off the surrounding high ground and Sid el Bahr fort. The reality was that only one floating bridge was made and the 1st Royal Munster Fusiliers used it to get ashore, though few made it to dry land. Those that did reach the beach could do no more than take shelter behind a low bank of sand – the Turks weren’t about to be swept off anywhere; although outnumbered they used their positional advantage and high level of marksmanship to slaughter the Munster Fusiliers and a battalion of 1st Royal Dublin Fusiliers attempting to land from ships’ boats rowed ashore. Recognising the futility of the position the Hampshire were not ordered ashore until nightfall when, under the cover of darkness, they were able to land safely and, together with the survivors from the Irish regiments were able to take control of the high land and fort. Arthur was evacuated from Gallipoli with rheumatism and was brought back to England to recover. This could have been the reason that he came to change battalion, from the 2nd to the 14th Hampshires. The 14th (Service) Battalion was formed at Portsmouth on 3 September 1914, one of the new battalions of Kitchener’s Army. It was not deployed to France until 6 March 1916, when it landed at Le Havre along with the other units of the 39th Division. Together with the 11th, 12th and 13th Battalions of the Royal Sussex Regiment the 14th Hampshire made up the infantry contingent of the 116th Brigade. A few months later Kitchener’s Army went into action en masse for the first time at the Battle of the Somme. Some battalions had seen action earlier, notably at Suvla Bay in Gallipoli, and the Battle of Loos, but most of the new battalions did not cross to France until 1916. The 39th Division were not used on the infamous first day of the Somme, but they were in action the day before near Richebourg l'Avoue, where the Sussex battalions suffered badly. The battalion was still north of the Somme towards the end of the month, manning lines at Festubert, site of the 1915 battle. During the day the enemy shelled various parts of our line Factory Post, Copse St, Guards Trench & Bath Street receiving attention in addition to parts of our front line. About 5.30pm our Stokes guns fired 500 rounds on to the enemies wire just left of Boars Head making a considerable gap in the wire. The 11th R Sussex on our left carried our a raid & the enemy retaliated on parts of our left Coy front causing us many casualties. A pigeon was again seen flying towards the rear of the enemy line. Our snipers claimed on victim. The snipers in out left Coy front report having seen a German observine our lines with his head in a tin similar to our own biscuit tins with eye holes cut in it. At 10.30pm searchlights were seen the following bearings were taken: S17a94, S20d. Killed: 15202 L/Cpl Barnes, 15018 Pte Hayward, 1526 Pte Olding, 8079 Cpl Rosier, 13943 Pte Smith, 13984 Pte Honey, 15026 Pte Simmons, 18170 Pte Butcher, 10213 Pte Andrews, 14425 Pte Farminer, 14611 Pte Miles. Wounded: 21619 Pte Pittesty, 12587 Pte Bennett, 13965 L/C Blackman, 12673 Sgt Swan, 19005 Pte Burchett, 14146 L/Cpl Mudie, 12916 Pte Gillard, 1442 Pte Larkham, 12753 Pte Fossey, 20215 Pte Sheppard, 15476 Pte Whitcombe, 12852 L/Cpl White, 21436 Pte Cook. Eleven dead, thirteen wounded on a day when the enemy had been ‘v quiet’ – it is very unusual to find such a detailed account of casualties, ORs Killed 11, Wounded 13 is the usual level of detail found in a war diary. 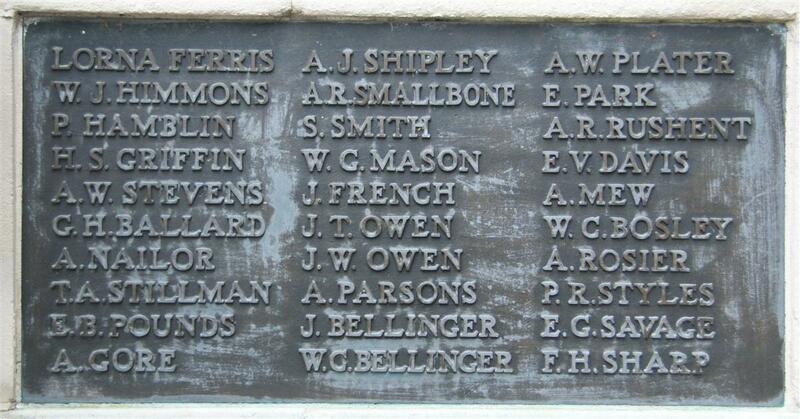 Sadly Arthur’s name (8079 Cpl Rosier) appears of the list of the dead, a victim of the enemy shelling. Corporal Arthur James Rosier, of the 14th Hants, was killed on July 23rd, his 27th birthday. He was the third surviving son of Mr and Mrs William Rosier, of Woolton Hill School. He had been in the Army for eight years, originally enlisting in the 2nd Hants, and being transferred to the 14th Battalion. He served in the Dardanelles Force, and was invalided for rheumatism, but on recovery was sent to France. His officer, writing to the parents, says: “He had not been with us very long, but all had got to love him. He was a good soldier, and a good friend. My prayers are for you in this your terrible loss; a loss which is keenly felt by all of us. He is buried at Richebourg St Vaast, and the grave is marked with a cross and will be well cared for.” Mr and Mrs Rosier had five sons on service. The survivors are: Walter, who closed his blacksmith’s shop, and with his man enlisted in the Royal Engineers as shoeing smiths; Harry in the ASC; Archibald in the Cyclists’ Corps and Thomas in the Royal Fusiliers. As the newspaper article states Arthur was buried at St. Vaast Post Military Cemetery, Richebourg-l'Avoue in grave II.M.13. As would be expected his name appears on the Woolton Hill Memorials (the memorial cross outside and the tablet within St Thomas' Church; less obvious is his appearance on the Newbury Town War Memorial (tablet 1) and the parish memorial from St Mary’s Church, Speenhamland. It can only be surmised that one of his parents or siblings was resident in Speenhamland when the call was made for relatives to come forward with names for commemoration. Until this is proven there remains some suspicion that it is another A Rosier that appears on these two Newbury memorials. Indeed it is possible that the A Rosier on the Newbury memorials is an error and is a duplicate entry for Alan Rosier Rushent, who appears on the same two memorials. For more on East Woodhay (inluding Woolton Hill) and WW1 download The Great War in East Woodhay by Graham Heald of East Woodhay Local History Group.